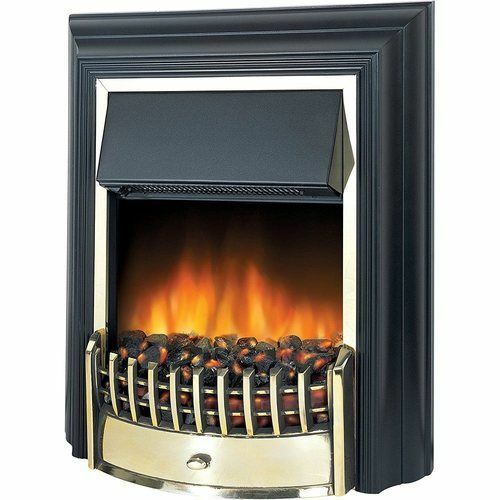 The Dimplex CHT20, Cheriton Electric Fire with Optiflame in Black and Brass is ideal for use in Living rooms, Lounges, Dining Rooms, Bedrooms, Study, Conservatory etc. This freestanding fire from Dimplex will warm your home like a real fire. It uses clever tech to produce a realistic flame and glow that will keep you warm on cold winter evenings. There are 2 heat settings to choose from, so you can opt for as much or as little heat as you need. The flame works independently of a heat source, saving energy. Plus, you can enjoy the flame and coal effect all year round. And, the black finish with a brass effect will give a contemporary feel to your home. Dimplex are selling this on their website for 250 pounds; we bought it from Electrical World, and including DHL Express to us here in Hong Kong, it was still cheaper by twenty quid! The fire is just what I was looking for, works perfectly and certainly transforms our living room. Electrical World, thanks so much for such a first class product at an amazing price, and super fast delivery (it left their warehouse in Northern Ireland on Monday - arrived at my door Friday morning). Would recommend this company without hesitation!